Here’s a You Tube video done by someone called “puntocaramelo” to accompany Celine Dion singing Ave Maria. It’s a meditative delight, both visually and audibly. Click here and enjoy. A gift for all this afternoon: A poem by Jimmy Stewart about his dog named Beau, from a Johnny Carson Show clip. It is such a heart-warming performance. Click here and enjoy. The Post – Dolphins: What canvas, What image? Okay. So the easy part is over. I know I want to do a painting of dolphins, to capture their beauty, fluidity, personality, intelligence. Now we come to the hard part – how to execute that? I will say that the short answer is – it comes down to gut feeling about composition and canvas size and shape. And that nothing is cast in concrete. One can get halfway through the painting only to realize you need to turn the painting 90degrees and start again, or paint over the whole thing and get a new composition. However – I do try to narrow some things down then follow my gut. Probably the best I can hope for is to answer three first questions , then identify what other questions need answering as I go through this process. 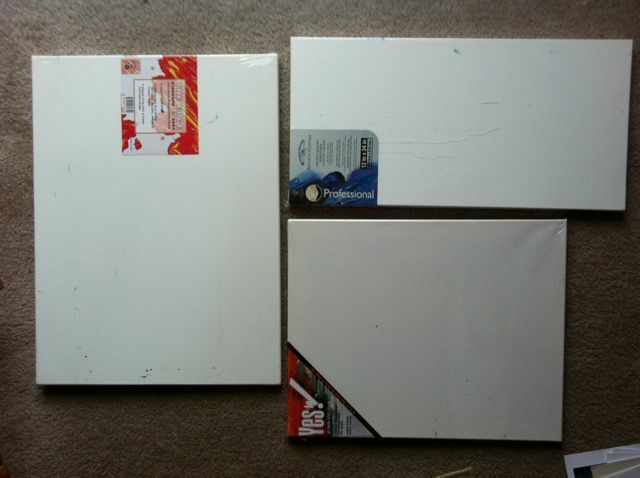 1) what size of canvas? The size and orientation are determined by the composition, though composition is determined by the size and orientation of the canvas. To get to the final choice, at least for me, it is a working back and forth, see-sawing between all three until the choices are narrowed down to a decision. 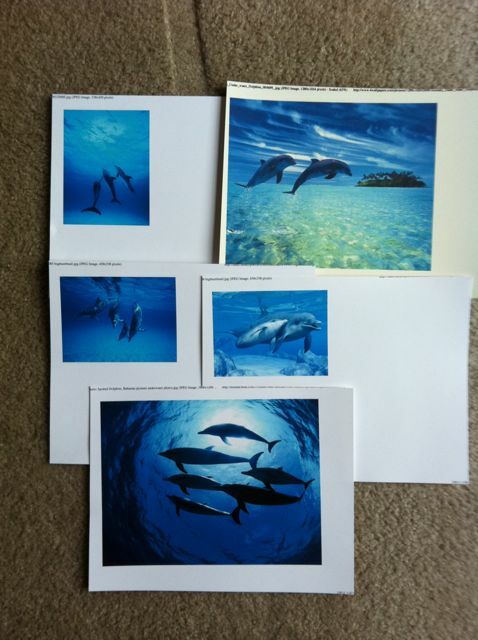 I start by going to Google images and just printing some pics of dolphins that “spoke” to me to get an idea of what compositions might work and what they even look like. Also, at this point my gut tells me “simple vs. cluttered,” so I’ll keep the number of dolphins low. One solitary dolphin feels wrong as they’re social creatures, so I think I’ll keep the composition to two or three at most. In looking at the pics I see I could do horizontal dolphins in a horizontal canvas, and it has potential. I can also do vertical ones in a horizontal canvas. However that means dolphins far away. Vertical dolphins on a vertical canvas feels better than on a horizontal one. You can get closer to them. So which is it? horizontal dolphins on horizontal canvas, or vertical dolphins on a vertical canvas? Let’s take a break and consider what size canvas. Let’s face it. This painting could go from 2×4″ to 4’x8′ or a wall fresco. But I work in more intermediate size ranges and avoid the extremes. My favorite size often is 8×16, which is an odd size but I like it. It’s usually just big enough to capture creatures or seascapes and I just “like” that shape. But I think that will be too small for what I have in mind here. So we’ll go for a size a little bit bigger. My other frequent choices are: 18×24″, 16×20″ or 12×24″. So I think one of these will be my choice. Let’s leave size for a minute then and hop over to orientation. Re: orientation” for the canvas used: Will I paint it with a “vertical” approach, meaning taller than wide? Or will I paint it “horizontally” meaning wide with a narrow height? If I go tall and narrow width, that means I’m showing many layers of water and I’m probably going to have to paint smaller dolphins….unless I have several in the background and one more forward, diving deep and straight down so I could make the full length of the dolphin apparent. Overall, it’s more of a “long shot of the whole area” with a focus on one dolphin. It could work as a way to show the personality of one closeup. Also, a dolphin is long and narrow, so I could use a vertical oriented canvas and have a diving dolphin to show that. But I’m not sure. If I go long on the horizontal and shorter on height this means I’m painting a narrower slice of water. Thus any dolphins shown will be larger and more the focus of the painting for sure. However, then the focus instead of being on one dolphin, becomes all of the dolphins as they’ll be about equal in size and close in proximity. And keeping with the long and narrow on the dolphin shape, a horizontal canvas means no diving dolphins – they would have to be horizontal as well to get across that whole “long and narrow” feeling. Okay, so I haven’t yet identified “which canvas and orientation” but I HAVE listed some pros and cons of each. And in reality, the canvas shape is really a choice between two. The 16×20 and 18×24 are almost identical in ratio, just for a little bit more size on each dimension on the 18×24,whereas the 12 x 24 has a much longer vs narrow feel to it. So the decision really comes down to 12×24 or one of those two. In the hopes of clearing up the confusion, maybe it’s time to go back to composition. To recap – most likely, vertical dolphins on a vertical canvas, or horizontal ones on a horizontal canvas. With the surface showing above. With two or three dolphins. And a canvas either 12×24 or one of the other two. I sense that I want a focus on one dolphin with the others possibly in the background. And to have a full-size dolphin horizontal feels boring. More drama in having one of three “plunging” down to the deep sea. Action. Not just being. Has anyone ever thought about dolphins in amusement parks / aquariums and wondered if they were happy? I have to admit I never thought about it much. I figured if they were kept humanely, fed well, kept active and busy, that was good. But maybe that’s not the case. This gave me pause, especially since for 10 years I worked on an ethics board protecting human beings in clinical research studies. I am supposed to think outside the box to make sure all are treated ethically. So I dug further into the topic of dolphin ethics and found a bit more. “However, Jerry Schubel, President and CEO of the Aquarium of the Pacific in Long Beach, CA, who served as the “Discussant” for the session on dolphins, had some fascinating comments on the matter. The blogger noted, and I agree, that emotional connections can go either way. Dr. Schubel’s comments appeared a week before a staffer was killed by an orca, in a Florida aquarium. I suspect that shifted public emotions too, but possibly not in a good way. So depending on public emotions to prove a point can be a variable thing. “There was a distinct lack of any animal-rightist stridency or blanket extremism among these experts. They disagreed as to whether holding dolphins and their relatives in any type of captivity was morally defensible. Dr. Marino argued that even the best captive conditions offer an environment one ten-thousandth of a percent (that’s 0.000001) the size of their native habitat. In fact, a number of the researchers, regardless of the side they are on, wrote jacket text for a book by Thomas I White: In Defense of Dolphins: The New Moral Frontier. At this stage it seems that this is an exploration of the topic, a learned discussion of pros and cons, with an eye toward making sure these beautiful brilliant creatures are recognized as highly intelligent sentient beings and treated properly. However even though I lean toward the side of not having them in captivity, especially just for entertainment purposes, the criteria Dr. Schubel gave for situations to have them in captivity, seem reasonable to me. As in many arguments of ethics, there is often some “black-and-white” and a LOT of gray. I often paint fish and undersea creatures. Squids, southern flounder, American shad, krill, just to name a few. I will paint many more. Hence I’m always on the lookout for great pictures. I don’t copy them but use them to inspire me, and to sometimes put together a composite image of a few creatures in a scene of my own making. Also as a person who paints and loves the ocean and its life, I am always seeking news on its health, problems, successes. A recent topic of interest to me, was the recent (2010) completion of the Census of Marine Life. ( http://www.coml.org) It boggled my mind that someone could do this and I wondered how. An article on Gizmodo recently appeared, that included a video on this very topic. As the video says, there are places in the ocean so remote they could not be explored, groups of fish so large they could not be counted, animals that travel so far they can’t be followed. If all that is true, how then did they do the Census of Marine Life for 10 years? The answer is revealed in this article and video. And you can find out what “OBIS” stands for. Just amazing work. For even more info, check out www.coml.org . Also, there are some great books out on the subject. World Ocean Census (ISBN-13: 978-1-55407-434-1) I picked up the book and it has photographs that are just beautiful. It is the story of the census. There is another I’m waiting to receive done by National Geographic: Citizens of the Sea – Wondrous Creatures from the Census of Marine Life that looks just amazing in the creature photographs it contains. I can’t wait to get it!. …….I can never get enough of the ocean……. You are currently browsing the archives for the Mortar category.